The Memorial Candle Program has been designed to help offset the costs associated with the hosting this Tribute Website in perpetuity. Through the lighting of a memorial candle, your thoughtful gesture will be recorded in the Book of Memories and the proceeds will go directly towards helping ensure that the family and friends of John Neville can continue to memorialize, re-visit, interact with each other and enhance this tribute for future generations. 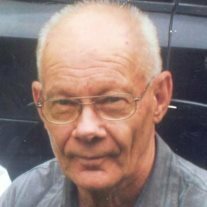 Obituary for John F. Neville Mr.
John F. Neville, age 78, of Wooster, passed away, Saturday, March 29, 2014 at West View Healthy Living in Wooster following a period of declining health. He was born near Blissfield, Ohio (Coshocton County) on April 3, 1935 to Milton and Mildred (Fox) Neville and has been a Wooster resident for the last 45 years. He married Janice K. Bucklew on November 23, 1968 in Akron, Ohio. She survives. He previously worked for Crown Fabricators as a Press & Brake Operator for 171/2 years before his retirement. Following retirement he had been repairing lawnmowers and small engines. In addition to his wife, he is survived by 2 sisters, Carol Ann Porter and Bonnie Neville both of Port Washington, Ohio; and a nephew, Mark (Kelly) Porter of Boliver, Ohio. In addition to his parents, he is preceded in death by an infant brother, James Neville; a niece and nephew. Services will be Wednesday, 12:00 p.m. at Custer-Glenn Funeral Home, 2284 Benden Dr., Wooster with interment to follow at Moreland United Methodist Church Cemetery in Moreland, Ohio. Visitation will be Tuesday at the funeral home from 5 - 8 p.m.
Memorial contributions may be made in lieu of flowers to: Hospice Life Care, 2284 Benden Dr., Wooster, Ohio 44691. To send flowers or a memorial gift to the family of Mr. John F. Neville please visit our Sympathy Store. To send flowers to the family of John F. Neville Mr., please visit our Heartfelt Sympathies Store.